Looks nice but when you land…..
“Measuring its colour is a real first – we can actually imagine what this planet would look like if we were able to look at it directly,” said Prof Frederic Pont, from the University of Exeter. In order to measure what this planet would look like to our eyes, the astronomers measured how much light was reflected from its surface – a property known as albedo. HD 189733b is faint and close to its sun. But as the planet passed behind its host star, the astronomers were able to measure changes in the spectrum as light reflected by the planet was temporarily blocked out. “We saw the brightness of the whole system drop in the blue part of the spectrum when the planet passed behind its star,” explained Tom Evans from the University of Oxford, first author of the paper. Earth looks blue from space because the oceans absorb red and green wavelengths more strongly than blue ones, and reflect the blue-ish hue of our sky. 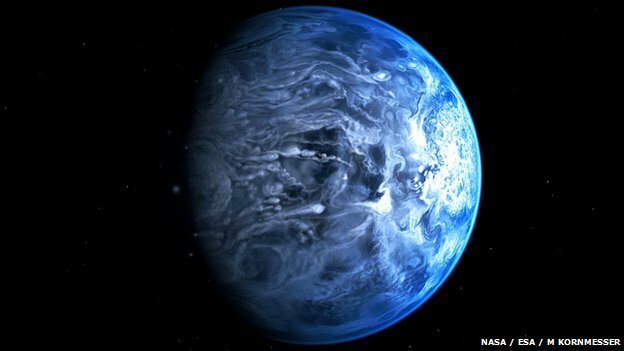 The exoplanet’s azure colour does not come from the reflection of an ocean, say the researchers, but is probably due to the hazy, turbulent atmosphere being laced with silicate particles – which scatter blue light. HD 189733b presented a favourable case for these kinds of measurements as it belongs to a class of planets known as “hot Jupiters”. These massive planets are similar in size to the gas giants in our Solar System, but instead lie very close to their parent stars.